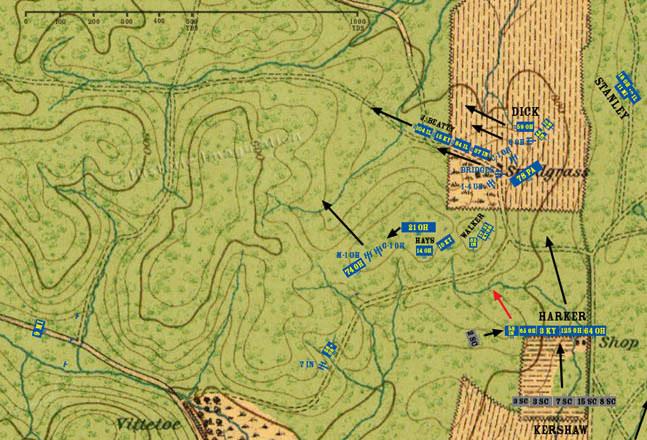 Major General James Negley has been feeling isolated since his division was ordered north earlier in the day and his arrival at Snodgrass Hill. He has had no communication from his superiors, and it has become obvious that the center and right of the army has been broken. Fearful for the safety of the numerous batteries, ammunition and supply wagons, and stragglers that have gathered in the area, he decides to gather the forces around him and retire to Rossville. He takes with him all the infantry with the exception of those under Brannan on Horseshoe Ridge, and the 78th Pennsylvania below the crest, evidently forgotten. He also takes all of the artillery except Battery I, 4th U.S. As they pass Hill Three they bring with them the 74th Indiana and the two batteries it was supporting. In all, Negley removes about 2,500 infantry, five batteries of artillery, and wagonloads of desperately needed ammunition. The 21st Ohio searches for the exact position at which it is supposed to deploy. The commanding officer isn’t quite sure.